For decades, mankind has had a continuing urge to create and enhance artificial intelligence (AI). This has been reflected and taken to all kinds of extremes and dangers in science fiction films, such as the Terminator franchise, A.I., i,Robot, Her and Transcendence. Ex Machina, Alex Garland’s directorial debut, smartly deals with the issue of AI again and the possible consequences of it. 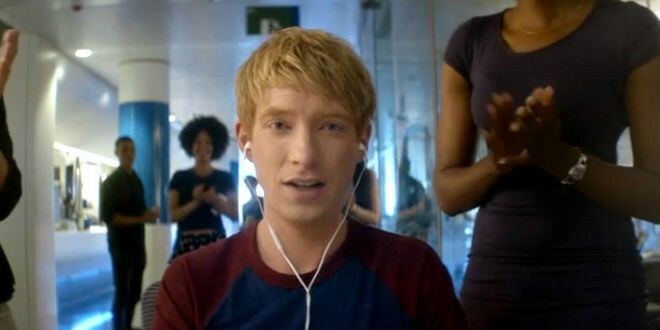 Caleb (Domhnall Gleeson) finding out at work, to his delight, that he has won the competition to be part of a break-through experiment. Ex Machina is about a programmer called Caleb (Domhnall Gleeson), who wins a competition at work to go to a remote facility to be part of an experiment. Nathan (Oscar Isaac), the man behind the experiment, wants Caleb to find out if his human-looking robot, Ava (Alicia Vikander), can pass the Turing Test. But neither the experiment nor Nathan is what they seem. Ex Machina is an interesting and stylish movie. Alex Garland successfully contrasts the beautiful and open nature of a remote location, with the claustrophobic feel of being based there. This creates a natural tension that never truly leaves viewers. It might be allayed for parts of the film, but at the slightest change in circumstance, this tension (re-)tightens one’s muscles, reminding viewers of how terrifying remote locations can be. In addition to this natural terror, Garland, who has written a superb script, tackles some thought-provoking (and disquieting) topics concerning AI, to augment one’s terrors. Some of the topics have already been done with varying levels of success in Transcendence and Her which dealt with the (disturbing) issues of consciousness within AI and having a relationship with AI, respectively. But Ex Machina arguably takes these issues to higher (and more alarming) levels by blurring the lines between people and machines; notably, by giving AI robots sexual desires and the capability to act on and enjoy them. Nathan (Oscar Isaac, unrecognisable with a beard) talking with Caleb about the purpose of the experiment. Ostensibly, the issue of sexual desire within an AI robot may seem far-fetched and ludicrous. But watch the documentary series Through The Wormhole, plus appreciate the intelligent ways that modern technology can respond to requests, and it might dawn on audiences that what we see in Ex Machina is not so far-fetched or ridiculous and that the lines between people and machines is genuinely being distorted. Bearing all this in mind, Ex Machina enables audiences to believe in this distortion because of Alicia Vikander’s astonishing performance as the AI robot, Ava. Ava’s (arousing) physique and general movements are robot-like. But her facial features and her observational and intellectual sharpness are so human-like that one almost forgets they’re watching an AI robot. Yes, it helps that Ava/Vikander is an attractive woman and that the special effects on her are outstanding. Equally, though, it helps that Caleb and Nathan, played well by Domhnall Gleeson and Oscar Isaac, respectively, buy into Ava’s supposed realness and respond to her (human?) personality in differing but very human ways. Indeed, their responses say something about their personalities. Yet, while audiences learn about Caleb’s background and why he is the way he is, the same cannot be said for Nathan. This is unfortunate as there is undoubtedly more to Nathan than he lets on; his brooding face, alone, tells us that. Caleb having one of his sessions with Ava (Alicia Vikander), to determine if Ava has human-like consciousness. 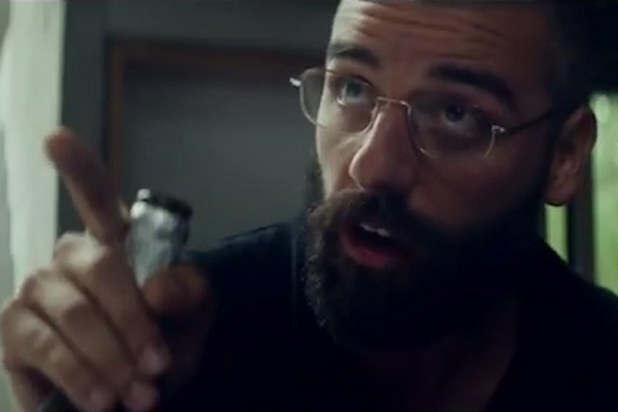 However, the lack of information given about Nathan is not the only element of Ex Machina’s plot that weakens it. The film is slow-paced; so much so, that for much of the movie one may wonder where the film is going. Moreover, the ending leaves itself open to scrutiny, not to mention out of kilter and jarring to the rest of the film. Nevertheless, one should not stress too much on the movie’s faults because so much of it is impressive. Over-all, Ex Machina is an intriguing, weird, and noteworthy film. The movie is slow and the ending is questionable, but all the same Alex Garland has made a striking piece of work in his directorial debut. He deals perceptively and philosophically with important issues regarding AI. These are extremely pertinent considering mankind’s disconcerting hunger to further enhance AI. For heaven knows that these issues will not be isolated to the realms of science fiction films for much longer as it is likely that the world’s first Ava will be created in the not-too-distant future.